How many code violations are illustrated in this picture? Although not a common installation, many electricians choose to use conduit fittings in improper applications. Conduit fittings and conduit bodies are designed to be used with specific wiring methods. In this article, we will take a closer look at what is wrong in this photo? Section 250.4(A)(2) of the 2014 National Electrical Code reads: “Normally non-current-carrying conductive materials enclosing electrical conductors or equipment, or forming part of such equipment, shall be connected to earth so as to limit the voltage to ground on these materials.” 250.132 also requires that isolated sections of metal raceway or cable armor be connected to an equipment grounding conductor. As you can see from reading the relevant code sections, the conduit body shown in the picture must be grounded. Since this type of conduit body does not have a termination point for a grounding conductor and is not connected to a grounded enclosure through a metal raceway, it is impossible to make this installation code compliant. 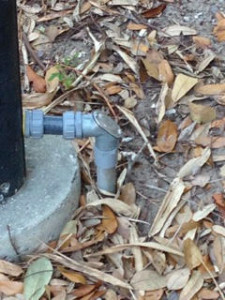 Some electricians may try to drill and tap the conduit body for the connection of a grounding conductor but this would also be a code violation. Section 110.3(B) of the N.E.C. states that all listed or labeled equipment be installed and used in accordance with any instruction include in the listing or labeling. Listed conduit bodies would not allow this type of modification. One exception to this rule can be found in exception number 3 to 250.86. This section reads that a metal elbow shall not be required to be connected to the equipment grounding conductor where it is installed in a run of nonmetallic raceway and is isolated from possible contact by a minimum cover of 18 inches to any part of the elbow or is encased in not less than 2 inches of concrete. It is acceptable to install metal elbows underground and use them with PVC conduit. This is a very common installation where the metal elbows are used to prevent the wire from burning through the conduit when making difficult wire pulls. The code does specify that the elbow must be isolated from contact by persons by being encased in concrete or buried beneath 18 inches of earth. This cover prevents the possibility of human contact if the contained conductors inadvertently energize the elbow. Don’t leave your fittings and conduit bodies isolated and ungrounded. Ensure safety by properly grounding all metal parts of electrical equipment. classes4contractors.com has electrical training courses, electrical exam preparation classes, free electrical practice exams, and electrical practice questions to help you learn more about the National Electrical Code or prepare you for your upcoming electrical exam. Our instructors have decades of experience and are licensed electrical contractors and master electricians. We also offer live instruction and private classes. Spend some time browsing our site and please email any suggestions or questions to classes4contractors@gmail.com. Send us a picture of a code violation or a proper installation and if we use it in an article, we will send you a great prize.